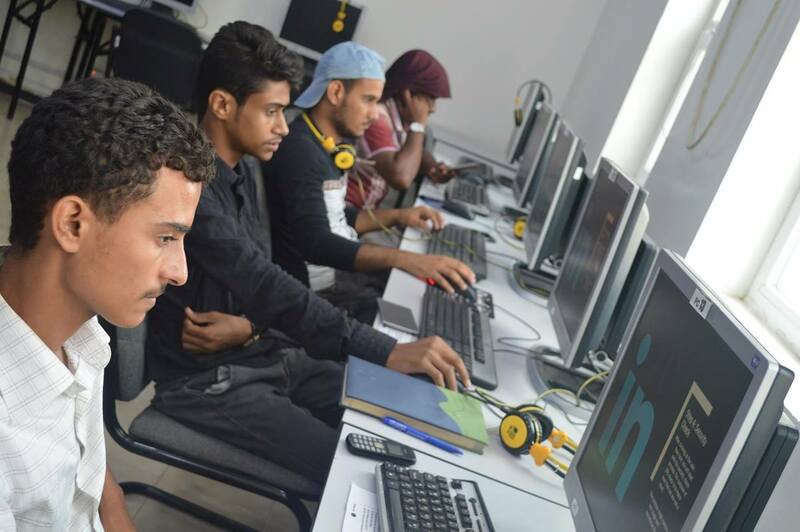 Since fall 2017, AMIDEAST has been working to address widespread unemployment and underemployment in Yemen, a country where 17 million of its citizens are in need of assistance. Through Nahdhat Shabab, a project funded by the U.S. Department of State, youth from a wide cross-section of society are learning technical and professional skills and gaining community-building experience, all of which will enable them to play a role in stimulating the economic recovery Yemen needs to undergird post-conflict governance. The project is training 600 young men and women between the ages of 18 and 30 in a variety of vocational, professional, and business skills in areas such as computer-aided design, refrigeration, hydraulics, plumbing, medical machinery maintenance, and renewable energy (solar installation). In addition, the project links youth to mentors in their communities and supports activities that encourage their involvement in community rebuilding and the country’s restoration and recovery. Ahmed Khalid Saleh Asaadi is one of them. “The project helped me a lot by gaining experience in a particular vocational field that is computer maintenance," says Ahmed, who received training in computer maintenance. "I also gained some skills, including working under pressure and strengthening my English. My chance now to work is better because of the training I have got. I'm now an engineer at the beginning of the road in computer maintenance." The project helped me a lot...My chance now to work is better because of the training I have got. I'm now an engineer at the beginning of the road in computer maintenance." The Nahdhat Shabab project is organized around more than 30 partners from the private and public sectors. Our partners also rotate as members of a community advisory board, facilitating project activities, providing guidance on a range of topics, and serving as mentors to youth trainees. They also offer diverse perspectives on Yemen’s labor market needs and the conditions required to prepare and qualify youth.